In one of its most-hyped-up announcements of recent years, Microsoft has entered the tablet market with the Surface, a 10.6 inch table running Windows 8 on Intel and ARM platforms. At the launch event in Los Angeles, CEO Steve Ballmer said that Microsoft could offer something "unique" in that it can do both the hardware and the software for the Surface to ensure a seamless experience, a comment that must have had Steve Jobs reaching 45RPM in his grave. The tablet will have two versions; a 676g ARM-powered Windows RT tablet that's 9.3mm thick and a chunkier 13.5 mm 909 gram Intel machine running Windows Pro with an Intel Core processor. The tablets come in 32GB and 64GB versions and have a liquid metal 'Vapor-Mag' frame holding a 16:9 widescreen HD Display, a mini DisplayPort, a full-sized USB 2.0 port and MicroSD slot. The Surface takes pen input from a magnetically-attached stylus and there are also covers, that come in an array of colours that range from funky to sombre. The covers house a multitouch keyboard with trackpad on the inside. A 3mm-thick Touch Cover or a 5mm TypeCover with moving keys are offered. An integrated kickstand means the tablet can be propped up at an angle of 22 degrees. Microsoft already uses the Surface name for its table-sized touchscreen displays manufactured by Samsung, but there's no apparent link between the two. 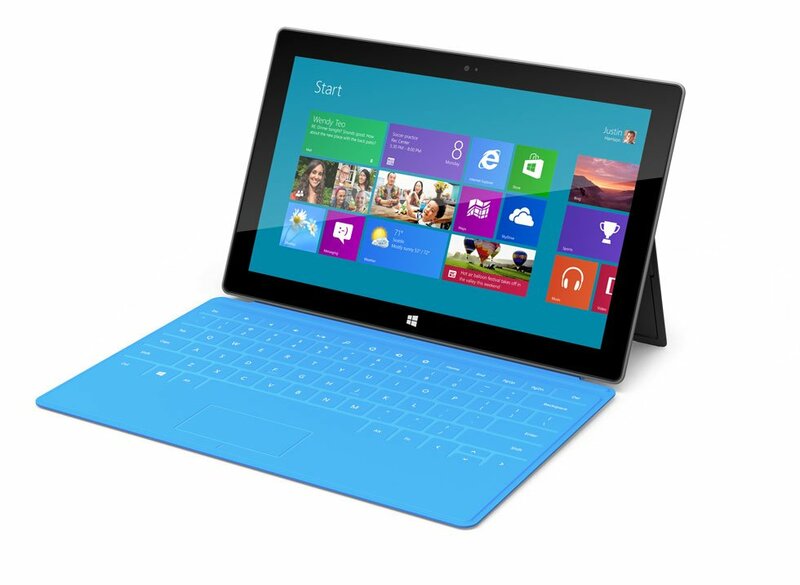 Microsoft said it was so named because the devices brought its software to the surface for users. Pricing details will be released later in the year, but they'll be in line with the Ultrabook line of slim laptops Intel is doing much to promote. Windows boss Stephen Sinofsky and others at the launch spent a long time hyping the keyboard, and the color scheme suggests a push for the education market.